Anna Marie Smith's Welfare Reform and Sexual Regulation is pathbreaking on several fronts. 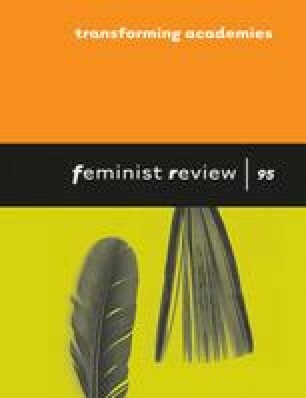 The author critically builds upon diverse areas of scholarship, including race studies, theories of labour and class, welfare regime studies, post-structuralist gender and sexuality theory, emancipatory feminist studies, political theories of democracy and law, and social theories of government(ality). Although most of the concrete references to these literatures appear in the footnotes – and, as a result, footnotes make up a significant portion of this volume – the sources are exhaustive and thoroughly substantiated. Smith's engagement with scholarship from both the social sciences and the humanities is exemplary in terms of interdisciplinary research. Although her methods in analysing welfare reform are social scientific, the author is critical of social scientific claims of neutrality and objectivity, stating that prototypical cause-effect interpretations are heavily embedded and invested in the deductive logics of policy reports. At the same time, the author critically engages with social theorists like Foucault by highlighting the significance of a grounded application of theory in a concrete context. For example, the author takes up Foucault's concept of biopower, applying it to an understanding of the US welfare system; in so doing, Smith unravels both the relevance and limitations of biopower as a heuristic construct. This book is impressively clear about radical feminist political projects, examining them at several levels: at the ground level by, for instance, accounting for the daily lives of racialized and classed welfare mothers and the men responsible for making childcare payments; at the policy-making level, in making policy suggestions for politicians and grassroots activists; and, at the epistemological level, in thinking through what is at stake in democratic living when welfare reform is not comprehensively and fundamentally modified according to a feminist vision. In short, it is admirable that a single monograph can encompass the depth and breadth covered by this volume. After addressing this book's key argument in its simplest form, I would like to provide a few additional provocations. Welfare Reform and Sexual Regulation convincingly demonstrates that the US ‘paternafare’, where the welfare state regulates recipients based on sexual behaviour and normative gender roles, expelled poor mothers from welfare programs such as the Temporary Assistance for Needy Families (TANF) to an even greater degree than workfare regimes where the welfare state regulates recipients based on employability. This is because paternafare discourages custodial mothers – represented by a proportionally high level of black/Latina single mothers – from remaining in the state provisioning system, not only through pressing them into impossible situations of double-responsibility (i.e., mothering and full employment in workfare). Rather, the gendered welfare system also puts poor single mothers under severe surveillance, policing their sexual activities and private lives (requiring them to identify male sexual partners in order to be recipients from TANF, and enforcing those men to be responsible for childcare payments). This renders custodial mothers dependent on male payers and tied to pseudo-heterosexual family structures (regardless of these women's decisions to raise children by themselves). This overall process ends up exposing mothers to higher rates of retaliation from male payers. In sum, Smith argues that paternafare perpetuates racialized class structures; first by reducing opportunities for destitute mothers to get out of poverty without help from the redistributive system, and second by impeding collective class struggle across genders among the working poor through intensifying personal conflicts (i.e., by pitting custodial mothers against associated male payers). Basing her suggestions on meticulous argumentation, the author posits alternative methods of welfare reform that would provide universal entitlement without policing privacy or discriminating against nontraditional partnerships. Smith's arguments are trenchant in highlighting the limits of advocating for the commodification of domestic work through increases in income for care work or private work; such measures, she suggests, would not debunk the binary gendered division of labour and sexual expectations. Yet Smith stands by strategic essentialism, stating that we should work on income inequalities and the redistributive system insofar, as the unequal wage structure between ‘public’ and ‘private’ labour hinders the class struggles of poor, single mothers. Convinced by Smith's tight argumentation and straightforward suggestions, I want to think about two further possibilities. First, I wonder if it is necessary to think of Foucault's biopower, a key invention of modern liberal government (make live or let die), as simply disconnected or progressed beyond the sovereign power of threatening death (take life or let live). The author poses that biopower is not applicable in fully understanding paternafare when the welfare system does not nurture self-governing subjectivity through a confessional mode of power (‘craft of soul’), but rather deploys vulgar humiliation and punishment. To me, this is exactly what Foucault tries to show in elucidating the double edges of liberal governmentality, which devised biopower as a technology of regulation in combination with, rather than in replacement of, sovereign power as an alternating tool of regulation. In other words, biopower does not consistently represent liberal governmentality when it is found to be less useful than death-threatening power in a context of population control (exemplified by the holocaust context, which Agamben (1998) succinctly demonstrates). Thus, in a way, paternafare understood as explicit sovereign authority working in parallel to the logic of biopower (elevating the quality of the population by discouraging poor women's reproductive rights) might be an apt example of Foucault's framework. Further, Smith downplays the religious tone of moral discourse in paternafare. I understand that downplaying religious moral ethos is a strategic course for focusing on the State and agree that she does provide sufficient information with regard to non-state actors. However, it might have been more cogent had the book made the moral discourse of paternafare more central, as a crystal-clear example of the ‘swarming’ effects of biopower – that goes ‘outward from the original target to the contiguous areas’ as Smith notes (p. 275) – by identifying both the religious forces (church-sponsored moral education as a ‘confessional mode of power’) and state authority (through crude violations of poor women's human rights in the name of protecting the population as a whole) as core factors, rather than choosing one over the other.